Mondo Fruitcake: Wedding cake "to dream on"
Wedding cake "to dream on"
﻿﻿﻿﻿ I recently had a comment on my post about Kate and Will's wedding cake. The commenter (smartygirl) mentioned that she's Canadian and traditional wedding cake IS fruitcake. I do agree with her that this tradition is going out of style, although, please, my Canadian readers, I welcome your comments on whether this is still a tradition up north. By the way, as you can see from the number of posts here, wedding planning and their expenses have taken over my life, so I apologize for the lack of fruitcake posts this summer. I hope to pick up a bit after the wedding, which will happen within the next couple months. However, in other news, some good friends are discussing a holiday fruitcake tasting, which I think is inspired and hilarious, so I will be sure to report back on that. Back to wedding fruitcake, and a musing on this subject: when I was young, I received a hand-me-down coloring book (yes, I really think it was; I think there were some pages ripped out or pre-colored) about a girl getting married. First, I must comment on the memory of how extremely frustrating it is to try to color wedding dresses in a coloring book. Wedding dresses tend to be white, and that color crayon is boring and, when using it, all the lines (as in "coloring inside of") show through. And yet, coloring the wedding dress, say, purple, was very unsatisfying as well. A couple of things about this: a) the tradition of sending wedding cake home with the guests has, I believe, gone out of favor at weddings lately. I remember this from when I was younger, but honestly, I haven't been to many weddings lately, so please do comment if I'm incorrect. b) I remember even back then thinking, how could you possibly stick wedding cake under your pillow, even if it's in a box, without it getting all smashed? I imagined white cake with white frosting oozing out of the cake box and all over the pillowcase, and I'm sure my mother would not have been pleased with that, even if it meant missing out on a dream of my potential groom. The fruitcake is the missing link in this puzzle. Being a hardy and traditional wedding cake, it would fit well into a wedding cake box (or as smartygirl mentions, a doily and cellophane), and would stand up to a head laying on it overnight. So there! 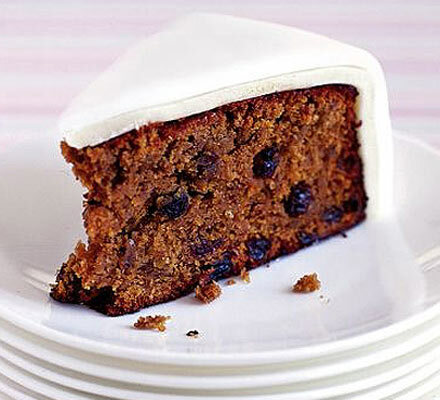 Fruitcake is the wedding cake "to dream on." And if I can't find the perfect box, a paper doily and cellophane will work quite nicely--thank you smartygirl! There's a trick to coloring a white wedding dress using a purple crayon.